Decatur, AL - Independence Tube Corporation, a leading manufacturer of square and rectangular structural steel tubular products with manufacturing plants in Chicago, IL, and Marseilles, IL, has installed a huge Braner/Loopco Turret Head™ Coil Slitting Line in its new 300,000+ square feet structural tube manufacturing facility on the banks of the Tennessee River in Decatur, AL. The new Slitting Line processes 98,000# x 72" wide hi-strength hot rolled black and pickled & oiled steel coils in gauges from .112" through 5/8". The new Braner/Loopco Slitting Line is designed to generate enormous slit coil tonnage to feed Independence Tube's structural tube mills. 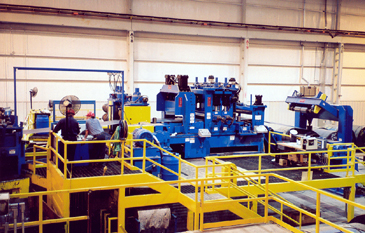 The new Decatur, AL, 5/8" Slitting Line is Independence Tube's second hi-tonnage heavy-gauge Braner/Loopco Slitting Line. 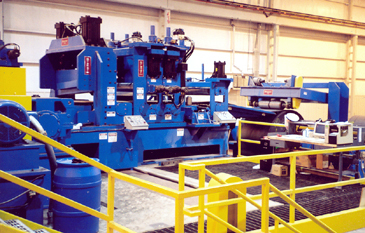 98,000# x 72" x 5/8" Hi-Tonnage Turret Head™ Slitting Line. DC Motor Cone Uncoiler and Free-Standing Coil Hold-Down. Coil Loading & Payoff: A wireless control Floor-Level Coil Car receives master coils weighing up to 98,000# and transports and loads the coil onto a Twin Housing Cone Uncoiler. The Uncoiler handles .112" through 5/8" gauge coils from 29" wide through 72" wide. Coil IDs can range from 24" through 34". The coil is supported on a pair of opposed heat-treated cones that support the coil from both ends. The Cone Uncoiler is ideal for efficiently handling large hot rolled steel coils as it can handle 24"-34" coil ID range with no adjustments or ID "filler" plates. The Twin Housing Uncoiler shifts laterally for quick alignment with the Slitter centerline. Each Uncoiler housing is equipped with 100 HP DC motor tension braking and reversing jog drive. 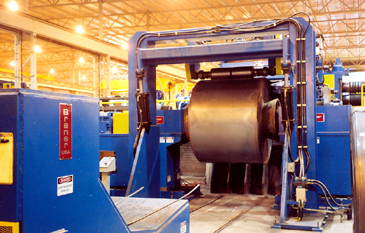 A huge free-standing Coil Hold-Down straddles the Coil Loading Car and assists threading hi-strength coil. The Coil Hold-Down Roll shifts laterally with the Uncoiler to allow coil alignment while the roll presses on the coil OD. Entry Section: Threading hi-strength heavy-gauge coil requires enormous power, synchronization, and agility. The Cone Uncoiler and Hold-Down combine to drive the coil head end to a Telescoping Blade Peeler that strips the outer wrap from the coil. The Peeler directs the head end into hydraulic Pinch Rolls and through a set of Roller Side Guides that aligns the strip along the Slitter centerline. The heavy-gauge Side Guides are equipped with quick-removal heat-treated tool steel guide rolls powered by hydraulic cylinders for strip alignment. A quick-open powered 5-roll Straightener removes head end coil-set and feeds the strip into the Crop Shear. The Straightener is also employed to remove the tail hook on the coil tail end to prevent equipment damage during coil tail-out. An infrared Edge Guide combined with second set of hydraulic cylinder powered Roller Side Guides assures precise coil alignment and guiding. A hydraulic Guillotine Shear crops off and squares coil heads and tails. Sheared coil tails are ejected into a powered Scrap Cart that travels away from the Slitting Line and dumps the scrap into a scrap container.